July 22st was the day move to my fourth family in less than a week. As I woke up that morning, I slowly got ready just in time to leave on time. I dragged my suitcases up the stairs IN ONE TRIP. I was not about to make two trips up and down the stairs at 8 am. Uh-uh, no way Jose! I carried three bags up the stairs all at once and I felt like Rocky Balboa doing it because I got a running start. I forgot to mention yesterday while packing my suitcases that I had more than one issue. In the house that I was currently staying at had a very indifferent staircase. It was normal until the bottom step. 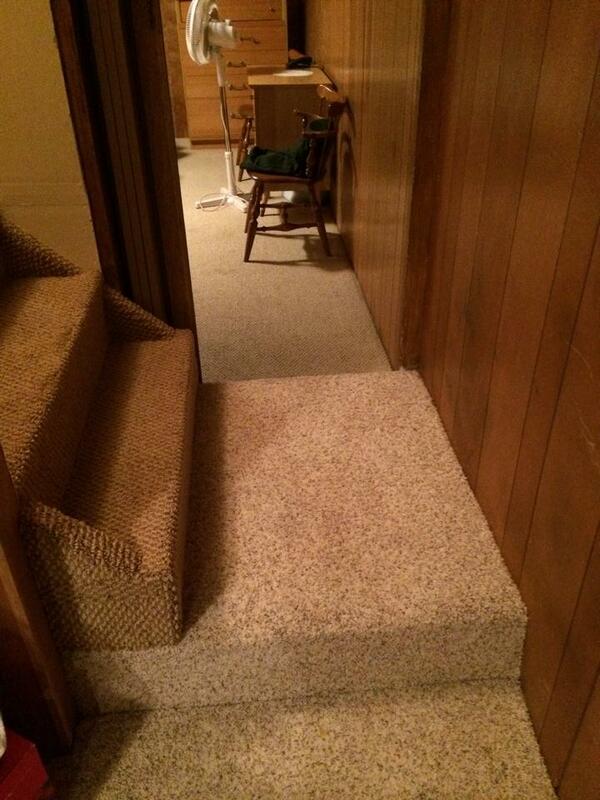 Usually a staircase at the bottom goes all the way down to the floor. This had a platform and then you turned either right or left and stepped down into the room you wanted to be in. It is easier just to upload a photo to show you! I completely forgot about this step while packing and BOOM I was down face to the floor. To be honest, I just laid there for moment or two to just absorb the fact that I actually just did that! Anyways, back to that early morning! I said my goodbyes to Geneva and Sophie, then Mark and I went on our way. We stopped at a house along the way to pick up a guy, by the name of Tod, to bring him to Greensburg with us. At the time, I remember he said he was struggling and desperately needed a job. He was going to Greensburg to see the town and find out what his options were. Apparently he is a pretty awesome cook from what he said and wanted to open his own restaurant! I took his word for it! Now, a year later he has his own restaurant called Red Tractor right in Greensburg. Although I have not been there, I can recommend it because this man had the dedication and will to make his dream come true. Plus, the food looks pretty darn delicious on his Facebook page for the restaurant and from what I have heard, it is as good as it looks! If you are ever in Greensburg please go have a bite to eat at Red Tractor and support this new business! I had to include Kiowa County Media Center‘s video of the Red Tractor introduction because the media center is beyond awesome at what they do! Watch it in HD because when you have that option, you must just do it! The ride from Hutchinson to Greensburg is about an hour and a half; on that day it was almost a solid two hours because of heavy construction. 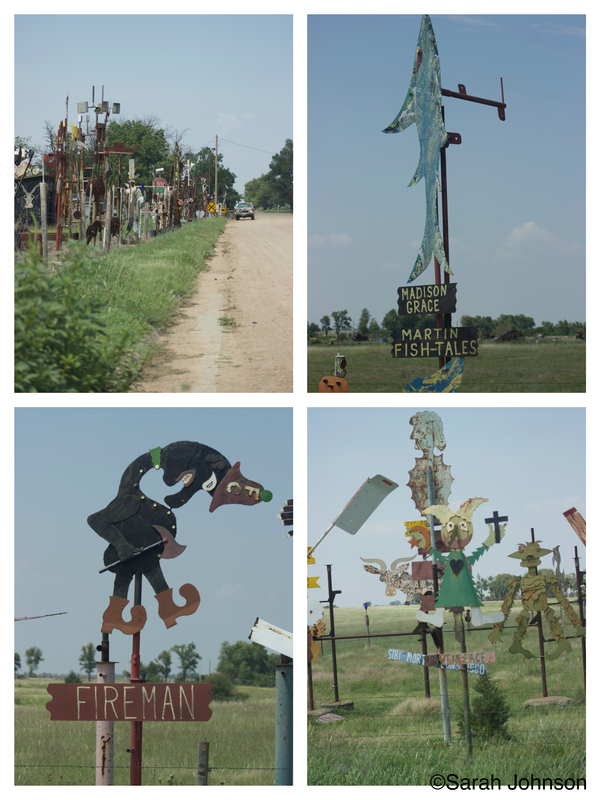 Once we finally got there, I got to meet Sue; the next person I would be staying with.We met her at her work and since she was in the middle of something at work, Mark took Tod and I to Mullinville to see some pretty interesting (to say the least) art. Ladies and gentlemen, I bring to you, M.T. Liggett. Liggett is possibly one of the craziest but talented people I have ever come across. 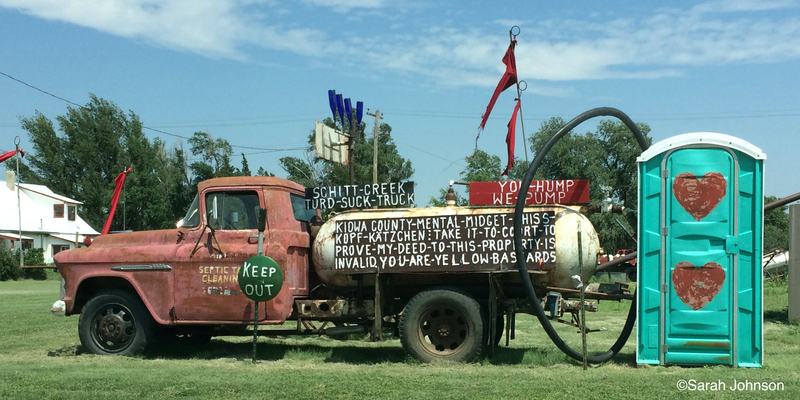 This man creates sculptures to get his opinion out into the world about local, state, and federal politicians. Most of the time they are pretty critical! I will admit though, I was intrigued. Intrigued is an understatement though; I was in complete awe. This man’s art has been my background image on my laptop for a year now. I will happily show you my favorite sculpture. I might even include my sister’s favorite sculpture too because its pretty funny and creative! Okay, so during the tornado FEMA was a big thing obviously. If you do not know what FEMA is it stands for Federal Emergency Management Agency. After the tornado leveled most of the town, people were not about to give up on their town. 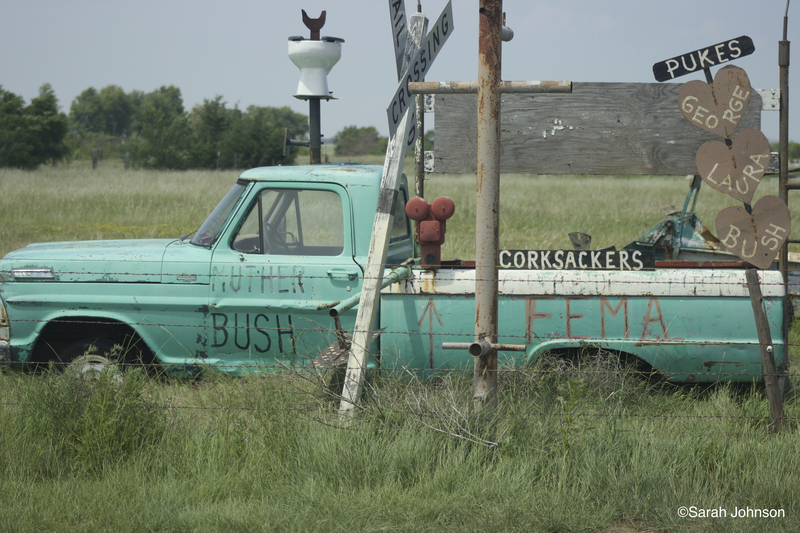 300 trailers were moved into a huge lot on the outskirts of town and that became known as “FEMA-ville” for months. Now, eight years later “FEMA-ville” is a large empty lot but where the 300 trailers had sat for months left a permanent outline of every trailer in the grass. I included a screenshot of what “FEMA-ville” looks like from an aerial view to give you a basic idea. 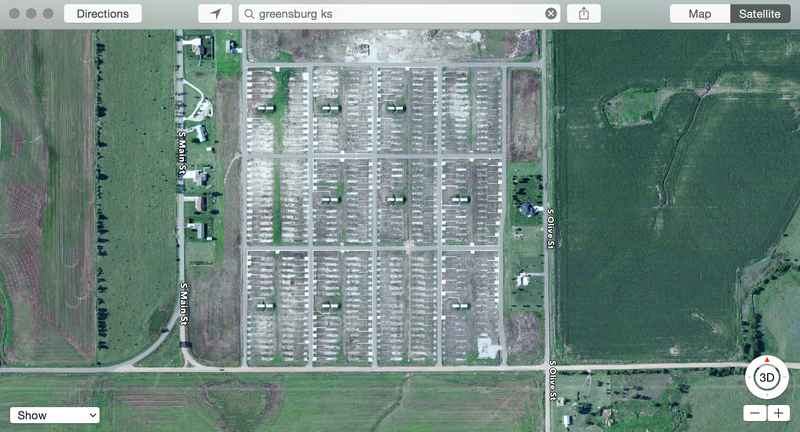 The feature photo of my blog is of “FEMA-ville” because this is how Greensburg started all over again. Those same people who fought for their town to rebuild and grow are now the true heroes of that town. They never gave up in those months that they lived in the trailers and look where they are now. At the time, when FEMA came in, I do not particularly think Mr. Liggett was too enthused with them’ along with President Bush and his family! So here we go. ROLL THE PICTURES! This probably would offend someone if they saw it on my laptop screen but in all reality, I do not give two craps about what other people think! I cannot help but want that truck underneath all of that junk though! This photo was my sister’s favorite and I remember her laughing out loud at it when I sent it to her that day! YOU HUMP WE PUMP! It truly made her day to laugh that hard! 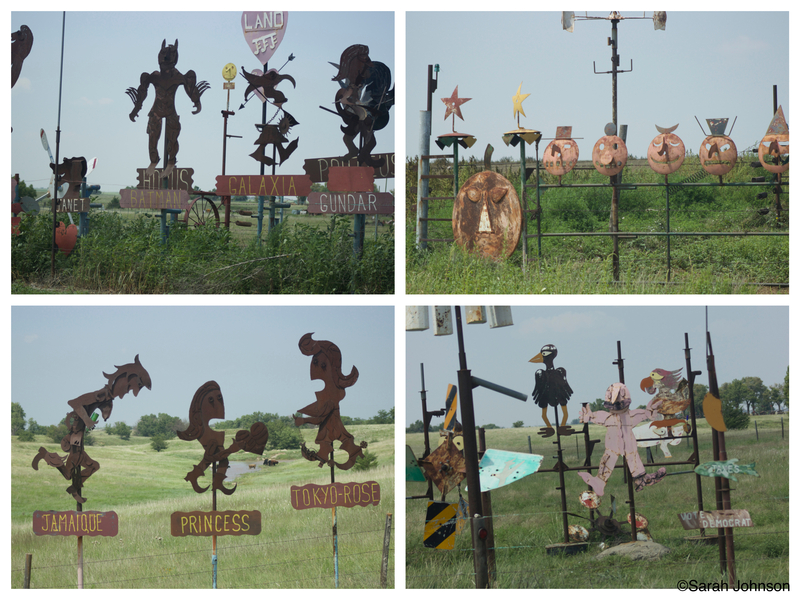 Liggett uses welded metal from sometimes scrap or old farm equipment to make his sculptures. He is an artist whether you want to believe it or not! 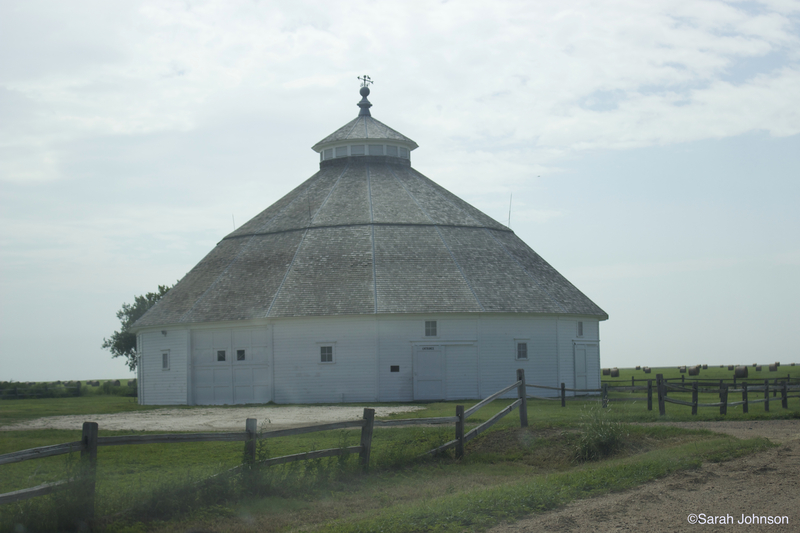 Once we drove down and saw that in Mullinville, we headed over to see the Fromme-Birney Round Barn in Mullinville. This barn was constructed in 1912 to hold draft horses. It stands at 50 feet tall and 70 feet in diameter. 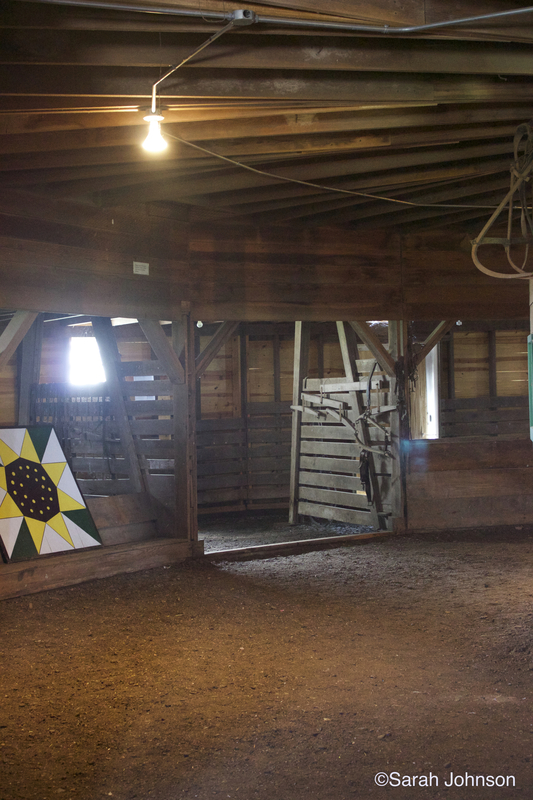 As the draft horses were replaced by tractors through the years, the barn became a hay storage barn instead. 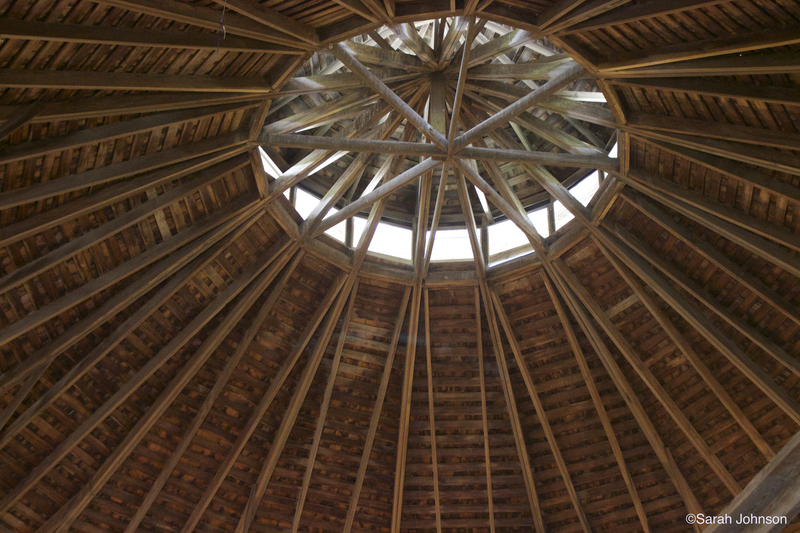 The barn is not perfectly round but rather constructed as a 16 sided barn that appears to be round. The barn is open to the public everyday for free. There are postcards and painted roof tiles from the original roof of the barn for sale. You purchase the merchandise through an honor system because you are thought to be and hopefully are trusting visitors. Once we got back to Greensburg, Sue took Tod and I to tour the high school. The high school is for students from Mullinville, Greensburg, and Havilland; all three towns are in a 20 mile stretch of each other. The high school is located in Greensburg, the midpoint between all three towns, but was wiped out by the EF tornado in 2007. This was their chance to make something of starting something new. They rebuilt the school to be more than energy efficient. In 2011, the high school, USD 422, was granted LEED Platinum certification. To say the least, this building would have been a dream to go to school in. On a scale of 1-10, 10 being the best, my high school was a 2; USD 422, was a 27 on the scale. You can see a full virtual tour video here on their website. Special thanks to the superintendent Darin Headrick for taking Tod and I on the tour! This man has a magnificent school district on his hands! After touring the high school, we headed back to Sue’s office in town to drop Tod off with Mark so they could go on their way back to Hutch, and Sue and I left to go to her home. On the way, I got to meet her two sons and see their herd of horses. When I stepped out the car, the road was sandy; which was surprising! The instant the sun hit my feet I could feel the burn starting! #palepeopleproblems Her sons are in the bucking horse business and have recently started to breed them. Although it will take a few years to see if breeding them pays off, it looks to be a good idea right now! They were beautiful horses that you could tell had the build to buck. We dropped my luggage off at Sue’s house and this was when I got to get to know her. We ended up talking for a while and sipping some ice cold tea. I am obviously not going to put the life story she told me on the internet but I can tell you this woman has a huge heart from the sound of it. After talking for a while she asked if I would mind helping to serve the dinner at the fairgrounds that night and of course I didn’t. I did not mind meeting new people. When we got there they had enough help already so instead we had some dinner and I got to meet some new people from town. Again, Kansas brisket, this food is amazing. It is seriously the best and I want it everyday for the rest of my life! There was one woman, whom I had met earlier in the week with Jan at The Green Bean, who came up to me and said whenever she see’s me I am always smiling and talking. She explained that no matter the situation, I was finding the best part of it and having fun rather than keeping quiet and shy. She also said that I had so much confidence and that it was practically spreading! This is the compliment any girl wishes to hear in their life. This was the most beautiful compliment I have had in my entire life and from that day that woman has been in my head whenever I try something new. I wish I knew what her name was because I would definitely make an effort to see her again when I go back out to Greensburg in a couple of years. This was just the start to an amazing evening. When we were finished at the fairgrounds, Sue and I headed off to one of her friend’s houses way out in the middle of nowhere (in my opinion because I have no idea where we were!) to drive through some of the land in the surrounding area. The three of us headed out onto the range to see some sites and to visit a special place near and dear to Sue’s heart. Along the way, I lost my second lens cap off my camera. That was the second one I lost during this trip. The other one is somewhere in the Cosmosphere. To whom ever found it, I hope you like the expensive Canon lens caps because I loved them. Imagine me saying that with a grumpy face! I hope the cows are enjoying my lens cap on the range too. When you’re going 30 mph you really don’t have a chance to stop and look nor was it really important! It was a magnificent night with a beautiful sunset. Sunsets are different in the west. You have more time to take photos of them for one and you can actually watch them go down beyond the vantage point. In PA, you see it crest down the mountain and that is it. It can honestly be kind of sad sometimes! The best part was, we were at Sue’s old property at the lake. From what she said, her and her family had some wonderful memories of times at the lake. I noticed how happy just being on the property and by the dock made her feel so I cannot even begin to imagine how many memories flooded her mind while we were there. I am so happy that she decided to share that part of her life with me because it was very special and it possibly one of the most beautiful places I have been in my life. As we drove back to Sue’s friend’s home I could help but realize that my life changing trip is coming to an end. But it was not over yet! When we got back to Sue’s house we were still talking like we had known each other for a while. I really loved staying with Sue because her and I communicated so well together. Sue was leaving for a trip the next day and was having some repairs done while she was gone so, I was helping her remove lots of her kitchen decorations so they would not get broken. At one point I was standing on a chair, I still remember it like it was yesterday, the moment Sue said “Careful the chairs tip — easily…” The chair started to tip and I was falling off but of course laughing like “That really just happened!” We had some great laughs that evening. After we were done we sat out on the porch and I got a real look at the stars for the first time in my life. The sky was full of stars and so incredibly bright compared to the stars at home. Just being outside that evening was so comfortable and relaxing. I got to call my mom while I was sitting outside that night and I do not remember the last time I was speechless about something but this night had left me speechless on the phone. Two more days of blogging and of course I had a few mishaps on the way but I’m getting it done!